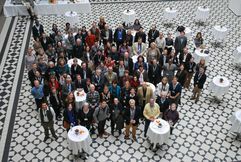 March 19th-20th, 2012 the Divison of Economic Education and Sustainable Consumption, TU Berlin hosted the 2nd International PERL Conference. Under the title „Beyond Consumption. Pathways to Responsible Living“ more than 50 speakers and around 200 participants from 40 countries discussed ways towards need satisfaction that go beyond excessive consumption of goods and services. One of the key note speakers was Tim Jackson author of the best-selling publication "Prosperity without Growth”. All contributions for the student film competition can be found here. The winning film "Coffee to stay" is produced by Anita Theel (TU Berlin). Anita’s video examines the unsustainable nature of “coffee to go” and encourages the use of reusable coffee cups to reduce the negative impacts on the environment of our coffee drinking behavior. Oviya Govindan (India) is the winner of the 2012 student esseay competition. Find more information about the Partnership for Education and Research about Responsible Living (PERL) here.